In previous lessons we learned how the camera figures exposure and how to adjust it to get the sort of exposure you want. 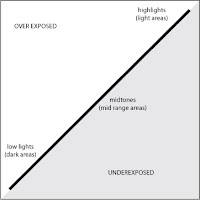 ISO, shutter speed, and aperture make up the bulk of the knowledge needed to put exactly as much light on the film (or sensor) as you want. Now that you know that, what else do you need to know about it? You need to know it all depends on the sensor you're using. Camera sensors between manufacturers and even between models from the same manufacturers aren't the same. Some may read a little hotter than others while some might be a little warmer (orange) or cooler (bluish). Some sensors even interpret light intensity a little differently than others. How does this affect you? Let's consider a few facts first. The typical photograph is a mix of light colors, medium colors, and dark colors. In the age of film people used to think a perfectly straight line between the colors was the holy grail of photography. The typical photo of the day was more of an S curve. 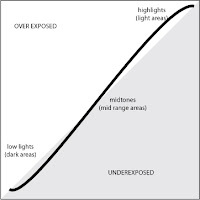 In layman's terms this means that parts of the photo that were lighter than the average brightness are slightly over exposed. And parts of the image that were slightly darker than the average of the photo were lightly underexposed. This is commonly referred to as being "crushed". Once people had the technology that allowed them to make a perfect linearly exposed photo, they learned that they didn't like how it looked! The holy grail was useless! It seemed dull and grey and not very eye catching. This S curve is called contrast, and the human eye likes a certain amount of contrast in an image. Most, if not all, digital cameras will automatically render your photos in this manner so, you don't need to worry about it. But it is good information to know as the more you know the more you can control the output of your own photographs. Lets look at the effect of it on this photo of the chicken. You can see the straight line on the right side. (You can also see the histogram. This is something we will get into in a later lesson) Now compare that photo to the one below. Now, you can see the line isn't straight. It is a bit curves, and you can see the result in the colors when compared to the linear photo. Both of these images came from the same image out of the Nikon D200. With this in mind, overdoing contrast is as bad as underdoing it. Keeping in mind the mantra, "all things in moderation," and you'll be fine. The next lesson will be reading, understanding and interpreting the histogram. Your on camera tool for good exposure.